Outdoor brick fireplaces allow you to take advantage of your outside areas all year round. A fireplace in your backyard will invite you and your family to spend more time in the outdoors. They can transform patios into warm and cozy entertainment areas for the fall and winter months, and they can also become the perfect focal point for a summer hangout spot for your friends and family. Adding a brick fireplace to your outdoor patio will help broaden your living area and increase the value of your home. The fireplace should match the existing landscape as it will be a focal point where all other outdoor furniture pieces are centered. Brick fireplaces can range from elegant to simple styles; the aesthetics will depend on your own taste and budget. If you’ve already decided to add an outdoor fireplace there are a lot of factors you should consider. Use this guide to understand all the available options and narrow down which brick fireplace is right for you. The fuel type for your outdoor fireplace. Wood Burning Fireplace: Traditional fireplaces are wood burning. These allow you flexibility when it comes to choosing their location in your patio since they are freestanding structures. For this type of fireplace, you will need a smoke chamber leading to a chimney with a spark arrester. Gas Burning Fireplace: You will need to have your contractor find a gas line you can tie to the fireplace. This will limit the locations you might choose. Dealing with a gas line may increase the overall cost of your project. These do not require a chimney and only need a small vent or pipe. Propane Burning Fireplace: Just like the wood burning fireplace, a propane fireplace can be located anywhere in your backyard. Similar to your barbeque grill, all you will need is a propane tank. 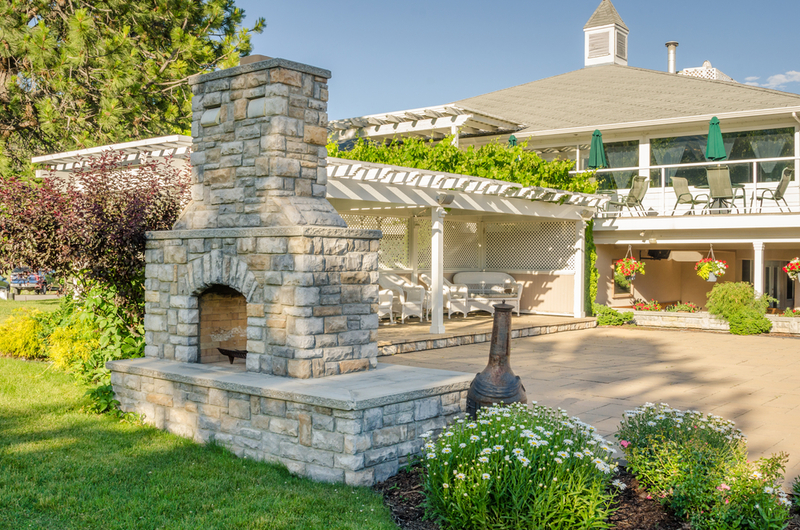 Choosing the right location for your outdoor fireplace. You’ve probably already given some thought to the location of your new outdoor fireplace. However, there are certain elements you should always keep in mind before committing to a specific location. Safety: It is crucial to keep safety in mind. Make sure the area will be clear of fire hazards such as hanging branches, bushes, dry grass, decks, wires or nearby buildings. You should also plan ahead and verify you have a nearby waterspout or a fire extinguisher. Smoke: Pay attention to the prevailing wind direction to make sure this will not become an issue for you or your neighbors when you use the fireplace. Size: While the size may vary depending on the style you chose, it is important to have additional room around the fireplace to accommodate seating and other outdoor furniture. Accessibility: Making sure the fireplace is easily accessible is important, since this will likely become a gathering place. The traffic areas should be clear of obstacles for both comfort and safety. This will also help determine how often this place will be used. The structure of an outdoor brick fireplace. Thee are three main components that make up the structure of all outdoor brick fireplaces. The Base: The base should be a solid and reinforced concrete slab. This will be built according to the type of soil, the extreme temperature conditions, the dimensions, and the weight of the fireplace. The Firebox: The firebox will be determined by the type of fuel you will use. The fireplace could burn wood, gas, or propane. Each type of fuel will have different requirement. The firebox will be the part of the fireplace that contains the fire itself. For safety, every firebox should be lined with brick. The Chimney or Vent: This part of the structure will also depend on the type of fuel used. Wood burning fireplaces need chimneys for the smoke and ashes produced. Gas or propane fireplaces only need exhaust vents. The design of an outdoor fireplace. There are a lot of designs available to chose from. Choosing the size and design of the brick fireplace will be determined the size of your patio, the frequency of use, the heating aspect, and your entertainment needs. If you are not sure where to start, look at your own home and its architectural style. This will help inspire your decision. These are some of the most popular outdoor fireplace styles available. Traditional Fireplace: This style of fireplace is typically made of brick. The firebox is usually arched, and they also feature a rectangular oversized mantel. This style goes well with colonial, craftsman, and ranch architecture. Southwest Fireplace: This type of fireplace uses stucco on the exterior wall. This allows it to get painted generally in earth tones or get decorated with ceramic tiles. Their appearance can include a stair-step structure or a rounded “kiva” style structure. Modern Fireplace: These outdoor fireplaces use a geometric, clean line design with sharp angles. They can be built with industrial materials. Mediterranean Fireplace: These fireplaces are simple structures similar to southwest style fireplaces. The differentiating factor is the exterior decoration with colorful tiles or rustic stone elements. The bricks used in the fireplace. The bricks used for building outdoor fireplaces are fire-resistant; they also give your outdoor fireplace a timeless character. Brick is made of clay which is naturally found in almost every state. They come in a variety of colors and textures you can chose from. The biggest benefits of using bricks is the variety of patterns you can create with them, the durability, and weather resistant properties. The regulations to build your outdoor fireplace may vary depending where you live. You can usually find out what these are by asking your local fire department. Since the fireplace will be close to your home you will want to make sure it doesn’t become a fire hazard. Once you’ve figured out the location, and the height of your fireplace, check the local ordinances to find out what special permits are required before you begin the construction. Brick fireplaces are great ways to improve your outdoor areas. They will give your home a very inviting look and they can be a very valuable addition to any yard. Cirigliano Natural Stone & Masonry located in in Pittsburg can help you install the perfect fireplace for your home. If you have any question about outdoor brick fireplaces or you need a quote, contact us.